This spring many people have been asking if the wildflowers are blooming in the areas that were burned by forest fires last fall. I am very happy to announce that not only are the flowers blooming, but in many areas the wildflowers are more prolific than they have been in years. 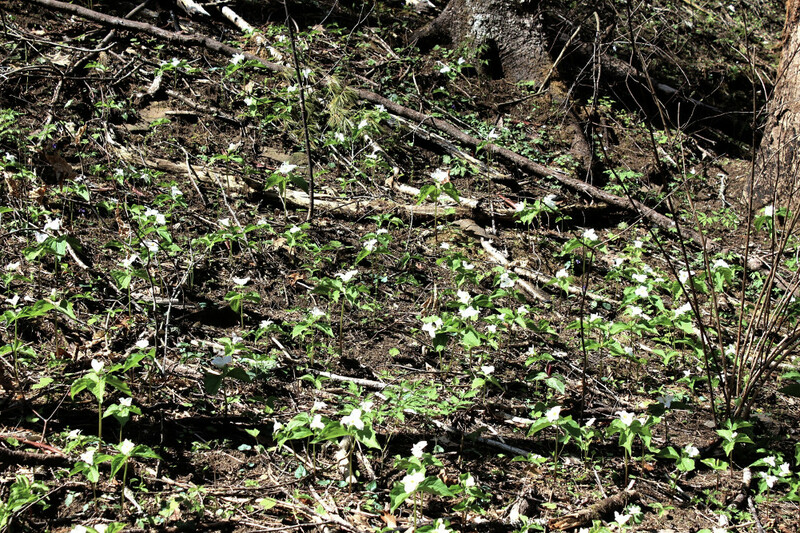 Areas adjacent to the beautiful Joyce Kilmer Memorial Forest Loop Trail, blackened by fires last fall, are covered with blooming white trilliums emerging from the ashes. The Loop Trail itself was untouched, thanks to the arduous work of the firefighters who defended the ancient trees with rakes and leaf blowers. Much of the fire burned only the “duff” or upper six inches of the forest floor. Although many wildflowers have shallow roots, plants like trillium and ginseng have roots that lay as much as a foot or more below the surface of the forest. Today our hardwood forests don’t really resemble Bartram’s description. There are far too many trees and a great deal of understory and brush. Not enough light hits the ground. Forest fires last fall burned up a great deal of the heavy brush, briars and undergrowth and cleared the forest floor, leaving much more room for the spread of the glorious wildflowers that we love. It is expected that for the next few years in the forests of Graham County the wildflower show will be extraordinary. From early April through mid-June visitors will be able to see a vast array of colorful flowers, including lady slippers, many species of trilliums, bellflowers, and violets. Caterpillars will more easily find food plants and more butterflies will be seen. Birds will feast on the insects that are busily breaking down the fallen trees and will increase the number of broods they can support each year. Make plans to come visit Graham County and walk the trails. This is a wonderful opportunity to see the forests and meadows in the process of naturally recovering from a forest fire. You will not only have the chance to see many flowers, birds and insects that you may never have seen before, but you can teach your children all about the natural role of fires in a forest.